The Dung Beetle is a trailer-mounted movable art system sculpted of recycled metal being built in Johannesburg, South Africa who’s main aim it to bring value to single use plastics and get people to up-cycle them into useful fuels. It resembles a dung beetle pushing it’s ball through the African Bush. Using the art, the fuel and flames, the trailer becomes a travelling,dynamic,multimedia educational performance workshop that brings together change makers in communities across Southern Africa. The main aim of this remarkable centerpiece for climate change and environmental education is to get communities talking to each other about how to solve these global problems. The garage-built system uses a plasma-cracker built into the Dung Beetle’s “dung ball” and is a working invention that converts plastic trash to fuel using plasma gasification. The system is all open-source and shared with participants and online audiences who are encouraged to make their own. Syngas, like methane, that will power the generator which will in-turn power lights, speakers and the shows; gas for use by other pyro people on site. Syngas will fuel two torches that burn and can shoot flame on command about 2 meters into the air out of the beetle’s upward facing bum to delight of the audience. Liquid fuel (low-emission bio diesel) which will power the truck towing the Dung Beetle and be able to be shared with other diesel Vehicles. The project enlists local self-reliance experts as well as regional and international groups who have successfully worked on these pressing problems to share their experiences, and like the successful TED talks, the talks get uploaded to Youtube for sharing globally. 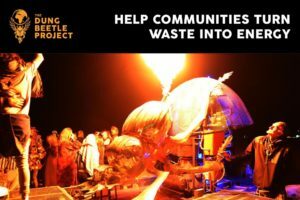 By using art and a working project to share environmental success stories, and also to teach people how to make their own plasma gasification system to get rid of single use plastics, the Dung Beetle aims to bring together everyone who enjoys a great spectacle mixed with fun and fiery facts about how we can all make a difference in our communities. We will partner with welders and mechanics who can build this system in their own town, as well as local technical colleges, musicians, DJ’s, performance artists and actors to bring a buring show of solidarity and locally-relevant information. After a week of work in one community the show rolls on to another, bringing some of the performers and researchers along to talk to the next community to share what they know and light up the imaginations of everyone who comes to the show. This online and travelling lecture series from talks on the Beetle include permaculture and climate-smart agricultural training based on the successful Zambian model. Recycling, like how Durban’s solid waste system now generates power for 6000 homes. How to build a gassifier like the dung beetle uses –for your own community! Water reclamation. Low-water sanitation solutions. Off grid solar solutions, and where to get them from southern African suppliers like Solar Sistersm or how to become one yourself! Solar water pumps that are cheaper than windmills. Low-tech bio-char soil rebuilding using local free local wood systems –with lessons from our very own project in Limpopo. Passive solar home design that is no more costly but keeps you cool in the summer and warm in the winter. How replanting indigenous species is renewing watersheds and making South Africans wealthier. Poaching alternatives, solar cooking solutions from our South African partner Sunfire, human waste to energy projects from Malawi, and many more. This entry was posted in Blog and tagged architecture, dung beetle, fuel, recycle, scrap metal, technology.